>Wordless Wednesday: Happy Birthday, Beth! > Today is my daughter, Beth’s 29th birthday. 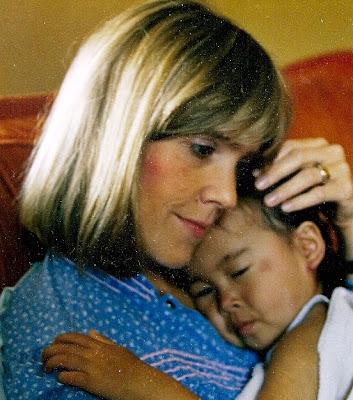 But November 4, 1985 was the day she came from South Korea to be our daughter, just a few weeks before her third birthday. This is Beth and me the first morning she was with us. I’m so thankful for the 27 birthdays we’ve been able to celebrate with Beth, and I miss being with her today, since she’s living in Denver. Happy Birthday, Beth! I love you. > Back in March I did a post to explain why I was retiring from iconography. Since then I’ve received a few inquiries about future workshops, including someone in Memphis who contacted me on Facebook today. March 5-9, 2012 in Nashville is only $495, including materials. It’s acrylics rather than egg tempera, but the instructor studied under Ksenia Pokrovsky, an excellent egg tempera instructor. The workshop is at an Episcopal Cathedral. Ksenia Pokrovsky is teaching several workshops in 2012. She’s known as one of the best instructors in the U.S. It’s egg tempera. Irene Perez-Omer is leading a workshop in Dallas in March and also in San Antonio in March, and in Houston in April and May. (and also one in Italy in October!) A former student of mine has taken several of her workshops, and really likes her. Her style is similar to the Prosopon School. 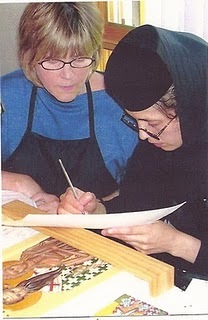 Holy Dormition Monastery in Rives Junction, Michigan offers an acrylic class every year taught by Mother Olympia (in photo with me). I’ve never taken acrylics, but if I was going to take another class it would be hers, simply for the joy of being with her and the nuns at the monastery. The monastery may also still host an egg tempera class each year, but I’m not sure. They haven’t announced their dates for 2012 yet. I hope everyone had a wonderful Thanksgiving. 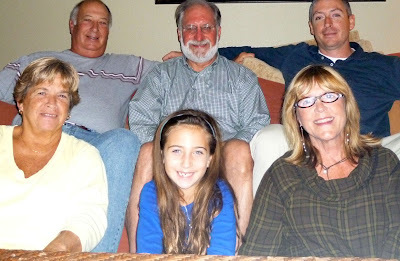 Some of my family came down here to the beach to spend the weekend with me, which is why I didn’t do a blog post last Friday. In the picture, back row: Tod, Bill and Jon Cushman (brother-in-law, husband, son); bottom row: Brenda, Sierra and Susan Cushman (sister-in-law, great niece and me). 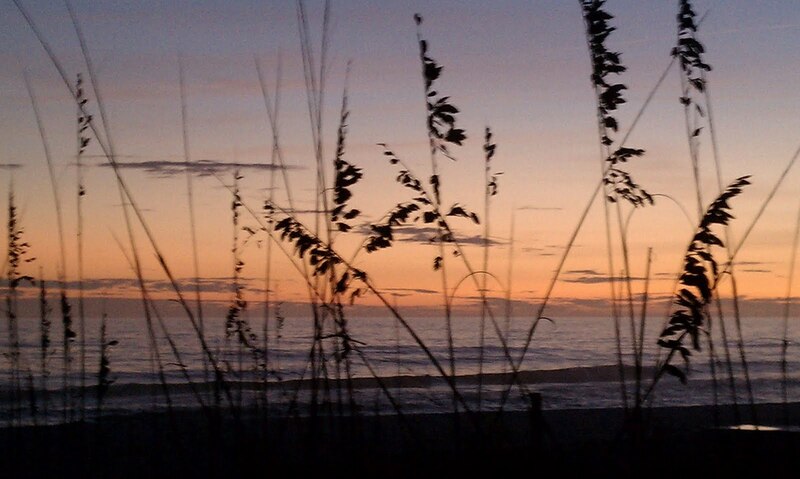 Today is the last day of my month-long writing retreat at Seagrove Beach, and I’m sad to be leaving tomorrow. I didn’t quite finish my novel, but the end is in sight and I hope to finish it by Christmas. 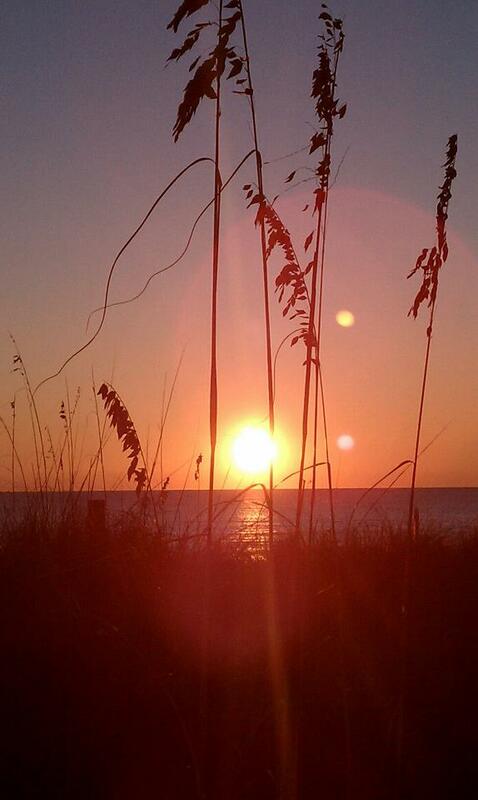 Meanwhile, the sun is shining on the beach as I pack to drive through Mississippi tomorrow, where SNOW is expected! I will miss so many things about my time here, but most of all, the sunsets. This is a short excerpt from Archbishop Demetrios’ encyclical for Thanksgiving Day, 2011. 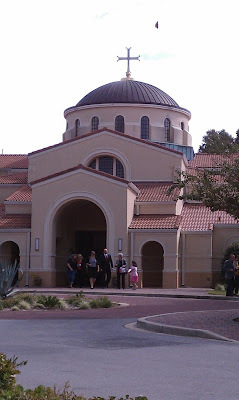 Father Gabriel Bultz read it from the pulpit at Saints Markella and Demetrios Greek Orthodox Church in Mary Esther, Florida, where I visited again this past Sunday. Then he made a few comments about how important it is that our faith is lived out in our actions towards others, and how that starts with being thankful. He said that thankful people reach out to others. As simple as those words may sound, it’s amazing how often we don’t relate to others with this attitude. I was blessed by these words on Sunday, and by Father Gabriel’s genuine call (he was close to tears) to his people to embrace this American holiday, especially as he spoke with his lovely Romanian accent. I love that Archbishop Demetrios says in his encyclical that we (Orthodox Christians) share an attitude of gratefulness “with all who celebrate this day.” I guess that means all Americans. Of all faiths and ethnic backgrounds and political leanings. This week I’m thankful for many things. For being able to spend a month writing here at this beautiful beach. For healthy children, grandchildren, Godchildren, nieces, nephews, and great nieces and nephews. 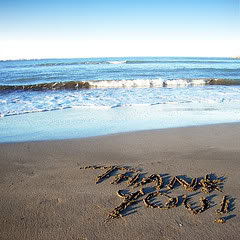 For friends who show me what thankfulness is by the way they love me unconditionally. Happy Thanksgiving. Let’ all be thankful people. P. S. You can read Archbishop Demetrios’ letter here. P. S. S. I’m especially thankful for sunsets. >When I packed for my month-long writing retreat here at Seagrove Beach, I included some things I didn’t bring last year, including the recipe for Aunt Barbara Jo’s dressing. The plan was that I would quit writing TODAY, (after 3 weeks) and spend Tuesday and Wednesday grocery shopping, cooking, and setting up for a home-cooked Thanksgiving meal here at the beach. My husband and oldest son will be here, and I hoped my brother-in-law, sister-in-law and their granddaughter would be joining us from Atlanta, but they can’t make it until Friday. 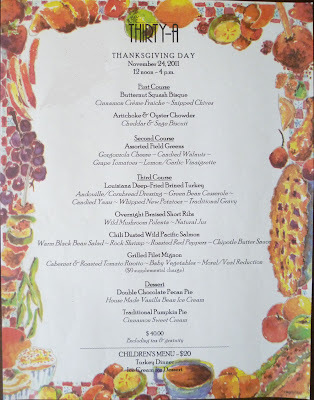 So, it will be just us three for Thanksgiving Day. Who would eat all that food? And besides, I’m into the final 2-3 chapters of the book now, so I don’t want to stop writing. So, how did my son and husband take the news? They are both thrilled… and here’s why. 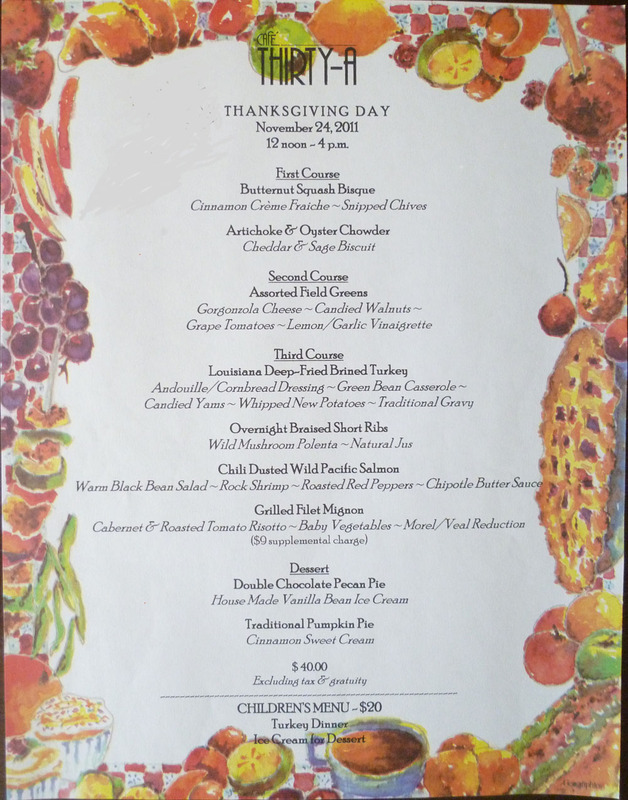 Check out the Thanksgiving Day menu at Cafe Thirty-A! We’ve got reservations at noon, which leaves the morning and afternoon free to enjoy the beach (or football watching) with no clean up. I promise to make dressing for Christmas. >What an exhilarating day! I’ve never been in actual labor (my three fabulous kids are all adopted) until today. The pain is excruciating (especially without drugs, which I managed to forgo until 4:45 p.m. when I finally gave in to a glass of Oyster Bay at sunset)… but (and I know, I know, this sounds cliché) it’s a good kind of pain. So, even though I deleted about 500 words from the work-in-progress today, I added another 1500 or so. But mainly, I figured out how the little bugger is going to get out of the birth canal. Head first. Hell yeah. A good day in the tent. I might even sneak out tonight and go over to Rosemary Beach for an art show. Have a great weekend, everyone. 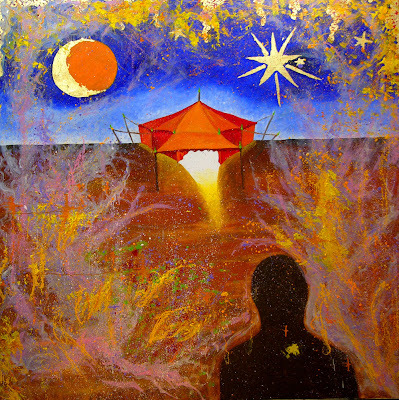 At the beginning of the Nativity Fast, she entered the Red Tent, not only to prepare with Mary for the birth of Jesus, but to prepare for the birth of her Real Self. צֶלֶם אֱלֹהִים. Imago Dei. Her prayer book and her Bible. An icon of the Mother of God, and an icon of Saint Mary of Egypt. Pearl of China: A Novel. Her leather and pearl jewelry made by Wendy Mignot. Kate Spade prescription sunglasses to shield her eyes from the Brightness. And because of her great vanity, even during the birthing process. Her cell phone, for contact with the midwives back in Arkansas and Tennessee. Books of poetry by Beth Ann Fennelly and Corey Mesler. Oh, and cleaning rags for the bloody mess. 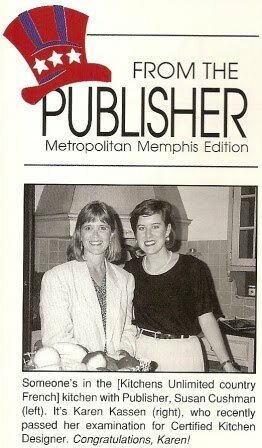 The picture is from my two-year gig publishing a trade magazine in the mid ’90s. Please hop over and read and leave a comment!I promise to check in later and join the conversation, but now, it’s time to write! 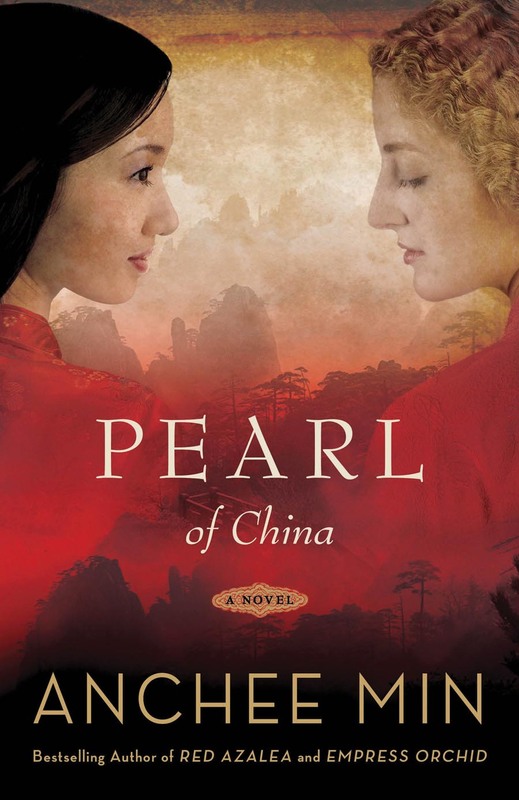 > Reading Pearl of China, Anchee Min’s novel about Pearl Buck, is teaching me a great deal about blending historical figures with fictional characters. I’ve been struggling with this in my own novel-in-progress, and only recently made some changes to make the work more believable. One change was to use the real name of one of the two historical figures in the book—Elaine de Kooning. de Kooning was one of the most successful female artists in the famed New York School of Abstract Expressionism. Since I’m fictionalizing much of her life in my book, I originally changed her name. A conversation with an intellectual rights attorney convinced me to use her real name, since (1) she is no longer living and (2) I make it clear that the book is fiction. Another change I’m making is to embellish the childhoods of these historical figures—especially the childhood of Saint Mary of Egypt—“Neema” in the novel, until she takes the name of Mary as part of her spiritual conversion. How does Min deal with historical accuracy? That’s what I’m aiming for with my novel. A high bar, yes. Don’t know if I can hit it out of the park, but it won’t be for not trying. Back to work now. Have a great weekend, everyone. P. S. If you haven’t read Pearl Buck’s works, my favorites are The Good Earth, My Several Worlds, Fighting Angel, The Living Reed, The Child Who Never Grew and Peony. Brilliant writer. And so is Anchee Min. >Wordless Wednesday: Guilty Pleasure or Research? > I bought this beautiful book (with deckle edged pages and wonderful old photographs and illustrations) as a treat to myself yesterday, over at a new indie bookstore in Rosemary Beach called The Hidden Lantern. You can read a nice review of the book here. 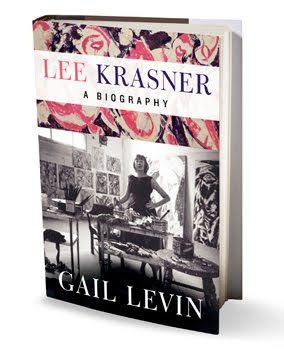 The book is Lee Krasner: A Biography by Gail Levin. Call it guilty pleasure, but I’m writing it off as research for my novel-in-progress. One of my main characters is based on the life of abstract expressionist artist, Elaine de Kooning, who appears numerous times in the book. I think it’s about time for another coffee break… on the balcony…. > I’ve been stewing on this post for a couple of months. Yesterday morning I had an experience that prompted me to finally address some issues I’ve been circling. I went to Saints Markella and Demetrios Greek Orthodox Church in Mary Esther, Florida, for Divine Liturgy on Sunday morning. It was a 45-minute drive from my writing “retreat” in Seagrove Beach, but well worth it. Not only is the chapel beautiful (not sure when it was built, but the architecture is very traditional, both in an Orthodox sense and in consideration for its location, in the panhandle of Florida), and the white walls are eagerly awaiting an iconographer’s touch to fill the nave with spiritual windows to heaven. (The physical windows in the dome let in just the right amount of light.) Only the Platytera has been installed, and it is a beautiful icon. The small chapel was nearly full of parishioners for the Sunday morning service when I arrived (5 minutes late) and I observed the cultural mix one might expect: Greek, Ethiopian, and others whose unknown ethnic origins surfaced during the Lord’s Prayer, when the priest gave parishioners the opportunity to recite the prayer in their native tongues. Touching, but not over done. What do I mean by that? Well, this is America, and English is our native tongue. And yet many Orthodox churches in this country still use a great deal of Greek, Arabic and other languages in their services—something that can be a bit off-putting to Americans visiting one of these churches, or even to members who only speak English. It disrupts the flow of the prayers for me when other languages are thrown into the service. Call me ignorant. Call me an American snob. But again, this is America. So, at the Greek Orthodox church on Sunday morning, I expected to hear much Greek throughout the service, especially in the music. I was pleasantly surprised that almost all the music and Liturgy were done in English, even though the priest struggled to make his words clear through his strong Romanian accent. 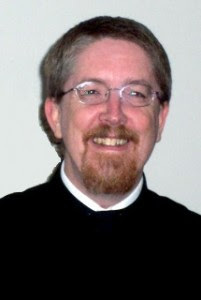 Father Gabriel served at Saint Nicholas Cathedral in Baia-Mare, Romania, originally, and he has also served in OCA (Orthodox Church in America) and Romanian parishes in this country prior to coming to this Greek parish in Florida. He even apologized before the homily (sermon) saying that sometimes he is difficult to understand, but he would try. His humility and joy were evident, and if I missed a few words or phrases due to his accent, they were insignificant compared to what I would have missed had he been speaking another language during much of the Liturgy. Counter to our culture. Yes. As do the head coverings and peasant-looking clothes worn by American converts in many Orthodox churches in America, not to mention the extra-long services which sometimes seem more appropriate for monastics than lay people. Those of you who have known me for a long time know that I bought into all of those traditions with my very soul at one point, about 20 years ago. I was that woman doing prostrations when everyone else was just making metanias. I was that woman with the head-covering when only a few others in a parish of 300 people wore them. I was that woman who drove her children crazy by demanding they go to church every time the doors were open (which at our parish was every day). I was that woman who skewed television and secular reading for about five years, immersing myself only in spiritual reading and prayer. Although there were very many things about those activities which may have strengthened me spiritually at the time, there was nothing moderate about my life then, and I’ve been struggling to recover my balance ever since. Father Gabriel is certainly trying.